Vaisakhi is a traditional Punjabi harvest festival celebrated in rural communities with processions, singing and colourful decoration. For Sikhs throughout the world, however, Vaisakhi also marks the inauguration of the Khalsa, the body of committed Sikhs who have decided to dedicate their lives to the values taught by the Sikh gurus. It is celebrated on 13th or 14th April each year. The Khalsa were inaugurated by Guru Gobind Singh, the 10th Sikh guru, in 1699. The Khalsa – meaning to be “pure, sovereign” – was founded to create a group of individuals who were prepared to stand up to injustice, to protect innocent people from religious persecution, uphold freedom, foster spiritual observance, promote honesty and equality, and ensure all people could access basic needs such as food and health. Five volunteers were initiated first and were given a new surname, Singh, which means lion. This tradition is now widely observed in all Sikh communities and includes women, who are given the title Kaur, meaning leader. It is important to note that this initiation is voluntary and that individuals choose to undergo initiation when they feel that they are ready to do so. The initiation, Amrit Sanchaar, takes place in a gurdwara (lit: ‘house of the Guru’, the Sikh place of worship), in a ceremony that includes recitals of the guru’s teachings and affirmations of the key principles of the faith. Amrit is a mixture of sugar (symbolising sweetness) and water (symbolising purity), stirred by a double-edged sword (symbolising strength), which is sprinkled on the eyes and hair and then drunk by the person being initiated. All those undergoing initiation recite the Mool Mantar, the foundational statement of the Sikh tradition, followed by key readings from the Sikh liturgy. Finally, all initiates eat the “karah parshad” – a sweet food of flour, sugar and ghee, symbolising that they are now all equal and removing any previous caste or social status related labels. Vaisakhi has often been described as the start of the Sikh New Year. But it is not. In the Punjabi calendar, the start of the month of Chet (14 March to 14 April in the Gregorian calendar) marks the start of the Punjabi/Sikh New Year. Vaisakhi is celebrated by Sikhs around the world with more vigour than the start of Chet because of its significance. The labelling of Vaisakhi as the “Sikh New Year” is probably a consequence of Sikhs trying to illustrate the significance of Vaisakhi to non-Sikhs. In 2018, the Sikh Press Association complained to IPSO that the Times had stated Vaisakhi was the Sikh New Year. But the complaint was rejected, because the description of Vaisakhi as the Sikh New Year was widespread. Sikhs visit their local gurdwara with those who feel they are ready to undergo Khalsa initiation. A procession called a “nagar kirtan” (loosely translated as “city praising”), is led by five Khalsa and proceeds through public spaces. This occurs in a number of cities around the world including many capital cities. 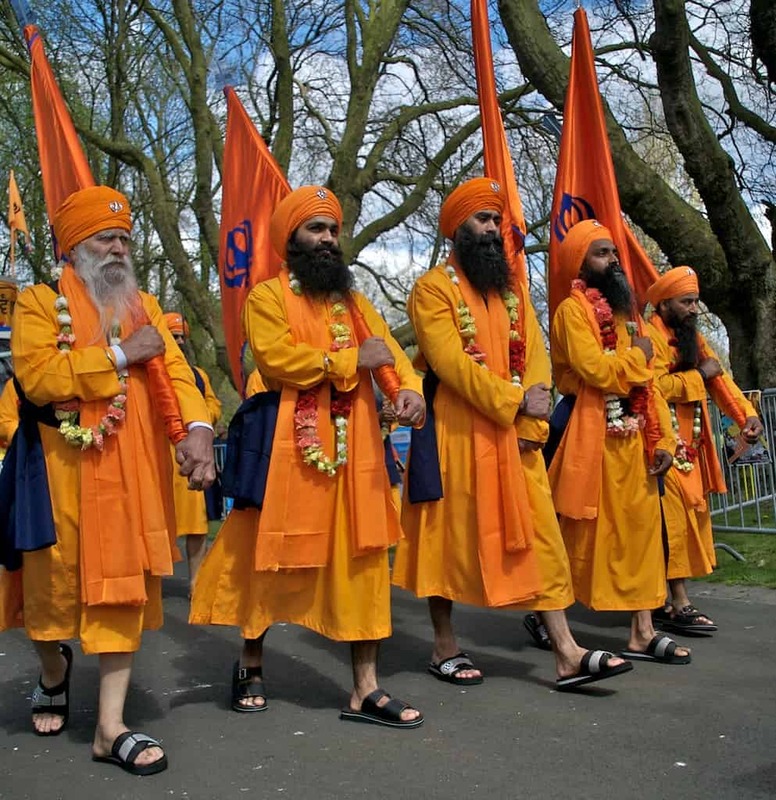 Many Sikhs wear bright colours including orange, blue and yellow. Guru Granth Sahib, the living guru of the Sikhs in the form of a book, are on a float as the main focus of the procession. The writings from the Guru Granth Sahib (Gurbani) are sung with those in the procession joining in. Food is served to all in a community kitchen (langar). Often there is a display of Sikh martial arts (gatka).